Live Talks Los Angeles is one of the few organizations whose mails I am subscribed to, and with good reason. They conduct talks and interviews with interesting people — their site has a huge archive of older events that are well-worth checking out. While I have not attended too many of their events, the one with Neil Gaiman being the only one from recent times, I love watching their videos — Moby interviewing Shepard Fairey was a recent highlight. Their emails tell me about new books that I should be looking out for, like Terry Gilliam’s autobiography from last year, and both Nigella and Madhur Jaffrey’s recent cook-books (yes, I keep track of cookbooks, sue me). Padma Lakshmi is in town on Tuesday talking about her memoir, and I am very tempted to go. 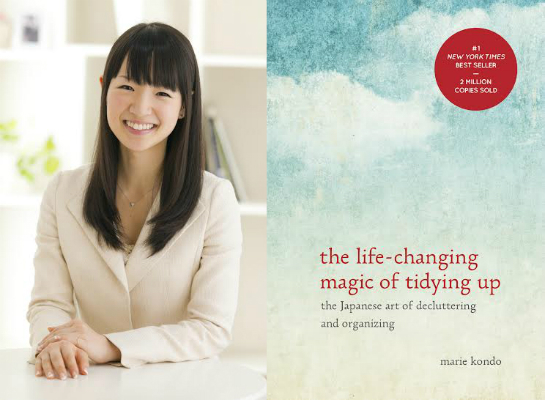 In one of these emails, I found mention of Marie Kondo, a lady who has made a career of the art of tidying. Her book The Life Changing Magic of Tidying Up has literally changed lives, and she is promoting her new book Spark Joy. She was one of Time Magazine’s 100 Influential People from 2015, her surname has nearly become a verb (to do a ‘Kondo’), and the strength of her clean-up strategy apparently led to record number of donations and consignments in the US last year, with people giving away piles and piles of belongings that do not meet the KonMari cleaning criteria. In a consumerist culture, she says, we should only own things that ‘spark joy’. The eyebrow-raised, skeptical version of myself backed away slowly from what walked, talked and sounded like another brainless minimalism fad that sweeps through the country — actually, the world, considering that Ms. Kondo has been translated into 13 languages. But I flipped through her first book at a Barnes and Noble. Surprisingly, what I read made a lot of sense. I ended up finishing all of it the next day, and my skepticism, I will admit, has been replaced by respect. While there are moments when the book’s instructions border on the ridiculous (“thank your dress and bag at the end of the day” or “hug your clothes to show your appreciation”), the majority of what she says is sane, practical and helpful. Her tone is gentle, and her approach to cleaning an iterative process that she has honed over the years; she takes readers through what did not work, arriving at her conclusions with clear-headed logic and a self-deprecating demeanor that is endearing. The reason the KonMari method makes sense to me is a function of my personality. You, familiar reader, should be aware of my propensity to indulge in ridiculous consumerism in the name of bibliophilia — in plain words, I buy too many books. Over the years, that has led to a proliferation of bookshelves and a read-queue that is pure Sparta. 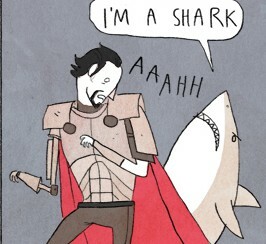 In the Frank Miller sense of the term, not the ancient Greek sense, thanks. This is not to say that I am unaware of my failings: my book-buying is no longer as undisciplined as it once was, and I am not shy when it comes to getting rid of books that do not fit my tastes anymore. But there is something deeper at play — this excuse that I, and others, give ourselves; that buying and hoarding books is somewhat nobler than buying clothes, or shoes, or any other form of consumerist activity that results in clogged closets and empty wallets. Really, bibliomania — which makes more sense than the gentler ‘philia’ — is an equally irksome addiction that is somehow bolstered by the reactions of well-meaning people around me. My favorite part of Kondo’s book was her mince-no-words approach to talking about books in one’s possession. The most common reason for not discarding a book is “I might read it again.” Take a moment to count the number of favorite books that you have actually read more than once. How many are there? For some it may be as few as five while for some exceptional readers it may be as many as one hundred. People who reread that many, however, are usually people in specific professions, such as scholars and authors. Very rarely will you find ordinary people like me who read so many books. Let’s face it. In the end, you are going to read very few of your books again. As with clothing, we need to stop and think about what purpose these books serve. Books are essentially paper—sheets of paper printed with letters and bound together. Their true purpose is to be read, to convey the information to their readers. It’s the information they contain that has meaning. There is no meaning in their just being on your shelves. You read books for the experience of reading. Books you have read have already been experienced and their content is inside you, even if you don’t remember. So when deciding which books to keep, forget about whether you think you’ll read it again or whether you’ve mastered what’s inside. Instead, take each book in your hand and decide whether it moves you or not. Keep only those books that will make you happy just to see them on your shelves, the ones that you really love. That includes this book, too. If you don’t feel any joy when you hold it in your hand, I would rather you discard it. What about books that you have started but not yet finished reading? Or books you bought but have not yet started? What should be done with books like these that you intend to read sometime? The Internet has made it easy to purchase books, but as a consequence, it seems to me that people have far more unread books than they once did, ranging from three to more than forty. It is not uncommon for people to purchase a book and then buy another one not long after, before they have read the first one. Unread books accumulate. The problem with books that we intend to read sometime is that they are far harder to part with than ones we have already read. If you missed your chance to read a particular book, even if it was recommended to you or is one you have been intending to read for ages, this is your chance to let it go. You may have wanted to read it when you bought it, but if you haven’t read it by now, the book’s purpose was to teach you that you didn’t need it. There’s no need to finish reading books that you only got halfway through. Their purpose was to be read halfway. So get rid of all those unread books. It will be far better for you to read the book that really grabs you right now than one that you left to gather dust for years. I am not saying that Marie Kondo changed something fundamental in me. Hey, I finished reading Life Changing last week, and have since bought 3 books — to clarify, lest you think I am a complete idiot, they were used and 50% off, they were parts of series that I am in the middle of, and over the weekend, to make up for it, I donated a crate of books and few bags of non-book stuff. The point though is that the KonMari method looks to me a viable way of approaching my priorities when it comes to buying and owning things – not just books. There are small tactics to tidying up that I began using almost immediately, and I will talk about them in a separate post. Ultimately, what Kondo recommends is no half measures, and for that I need time – maybe a full weekend, maybe more. The struggle is real, people! Watch this space. I think about 30% of my book reading is re-reads. Plus, I am a very moody reader. So, I can’t finish certain books unless I’m ready. So they have to remain in the pile. OTOH, I am terrible with keeping my books when I move. So, that helps me reduce the pile around me. For me, it’s a relic of my growing-up, where I needed to have some books in reserve for when there was a dry spell. I suspect I have written about it before. Rereading makes me feel very guilty, sometimes. But I am digging Kindle’s highlighting. I have never highlighted or taken notes before, and this is a new-found habit.